Recently I mentioned my Pimm's Cup Ice Cream and I had request for the recipe. In February over at Cookbook Of The Day we featured Serena Bass' Pimm's Cup recipe. This takes a similar recipe and turns it into ice cream. A few general ice cream thoughts. We use an uncooked sweet cream base. This is an issue if you are afraid of raw eggs. Since our eggs come fresh from our chickens, we don't have an issue with eggs. An uncooked base doesn't hold up well for an length of time. Frankly, we never need to keep our ice cream for weeks, actually it is gone within a few hours. This recipe has alcohol and therefore it needs to be processed a bit longer as it doesn't freeze quite as hard. Beat the eggs about a minute till they form thick ribbons. I tried serving it in cucumber cups. 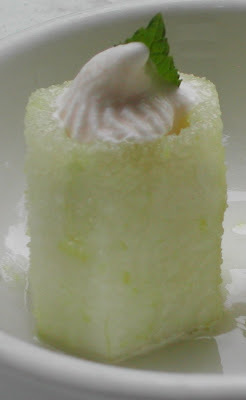 I hollowed out sections of cucumbers, and dredged them in a mixture of sugar and lemon zest, then piped in a bite of ice cream and garnished with a mint leaf. It looks nice but it is one of those ideas that needs to be served immediately. The moisture in the cucumber melts the sugar quickly. I tried to make the cups in advance, but they ended up being cucumbers sitting in puddle of sugar. Another option is to slice cucumbers and at the last minute, dredge them in the sugar and simply garnish the ice cream.